Is Government a Repulsive Spouse or Spoiled Child? Regular readers know that I get very excited when I see signs that more and more people are realizing that the real fiscal problem is big government. Even if the sound analysis comes from foreigners or international bureaucracies. Deficits and debt are bad, to be sure, but they are best understood as symptoms of the underlying disease of excessive spending. With that in mind, we have two cartoons that correctly identify the real threat to America’s future. 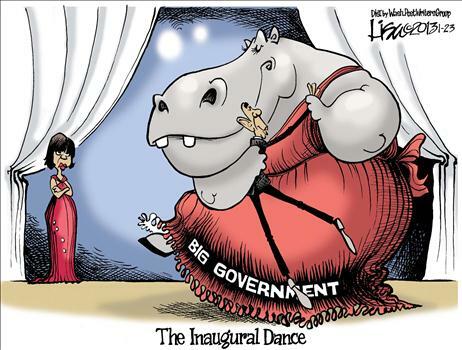 Here’s Lisa Benson showing the President enjoying a dance with his first love at the inaugural. 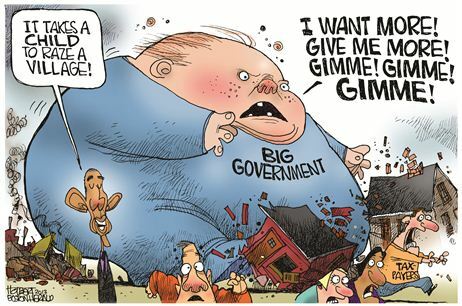 And here’s a Jerry Holbert cartoon capturing the rapacious appetite of a bloated public sector and the impact on society. As you can see here and here, it’s quite similar to the theme used with great effectiveness by Eric Allie. Except Holbert seems to emphasize deliberate destructiveness, rather than the blundering incompetence in the Allie cartoons. But the net effect is still the same. Big government is counter-productive government. What’s more realistic: A unicorn, Bigfoot, the Loch Ness Monster, or a successful government program? This isn’t a trick question. Even though I’ve presented both theoretical and empirical arguments against government spending, that doesn’t mean every government program is a failure. I suppose the answer depends on the definition of success. Government roads do enable me to get from Virginia to Washington every day. And the Post Office usually gets mail from one side of the country to another. By that standard, many government programs and activities yield positive results. But if the question is whether government achieves anything in a cost-efficient manner, you’re probably better off searching under your bed for unicorns. If you pose this question to someone on the left, however, don’t be surprised if they point to Head Start. The conventional wisdom in Washington is that this program gives low-income kids a critical leg up before they start school. I would like this to be true. I may not be fond of big and bloated government, but the best interests of these kids are more important than my desire for a talking point against the welfare state. Here’s what the Washington Examiner wrote about the program, starting with an explanation of what the program is supposed to accomplish. There are few institutions more sacrosanct in Washington than President Johnson’s Head Start program. The federal government spent more than $7.9 billion on the program in 2012 alone to provide preschool services for nearly 1 million low-income Americans. The program represents everything that is supposedly great about the liberal welfare state. It redistributes resources from wealthy to poor. It uses the power of the federal government to combat inequality by giving poor and minority students an educational boost before they fall behind their wealthier peers. There’s just one problem: It doesn’t work. Is that an empty assertion? Nope, it’s the evidence from the government’s own research. So what’s this costing the nation (above and beyond the failure to improve the lives of children)? 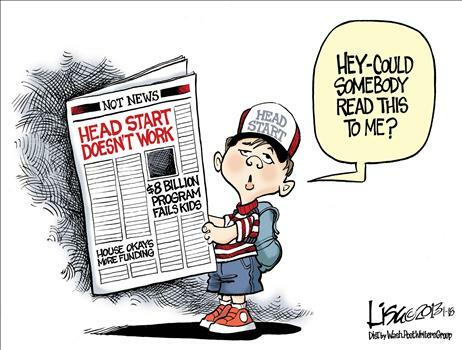 Since 1965, the federal government has spent $180 billion on Head Start. …Does that sound like a program you’d want to spend $8 billion on next year? Now imagine the good things that would have happened if that money was left in the economy’s productive sector. Or, if you like government, but at least want good results, imagine the good things that would have happened if state and local governments shifted $180 billion from the failed school monopoly into genuine school choice programs. But let’s close on an optimistic note. As far as I know, there’s no evidence that Head Start actually damages children. It’s just wasted money. That’s a much better track record than other welfare state programs.